One of the advantages of a Mombasa holiday is the many options you have. The beaches around Mombasa are everything you expect from a tropical beach setting and have many fine, not too expensive beach resorts. But Mombasa is also a great starting point for wildlife or nature safaris – several renowned wildlife resorts, as well as some nature and marine parks, are within a few hours driving. And if you’ve seen enough seen enough beach and nature, a Mombasa holiday also has a lot of culture and history to offer to: some of the oldest cities in East Africa where the famous Swahili culture has developed over many ages out of Arab, African, European and Asian influences. Fort Jesus is the first major tourist sights that you should have on your list for your Mombasa holiday trip. It's a centuries-old Portuguese fort that has been partially restored and turned into a local museum. Another spot to go walking for a bit more history, is Old Town. 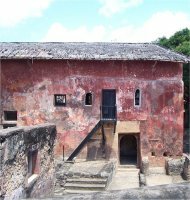 Both Fort Jesus and Old Town are in the eastern side of the city on Mombasa island. The Makupa market is the traditional open-air bazaar that will be a hit with any kind of shopper. Though there are plenty of suitable hotels right in the city, if you're going to be staying in Mombasa, you should check out the beach resorts. Some names you might want to look into are the Sarova Whitesands, the Mombasa Serena Beach Hotel, the Voyager Beach Resort or the Nyali Beach Hotel. These, and others, are reviewed on my Mombasa beach hotel page. The beaches along both the north and south coasts of Mombasa have long beaches of white sands on the Indian Ocean. Most offer many water and outdoor activities, but you can find the room costs vary widely depending on the level of luxury. Don't assume that a beach resort is out of your budget until you check. Most Kenya travelers will want to head out on a wildlife safari at some point. Of the most popular wildlife resorts, the huge Tsavo East and West parks are closest to Mombasa. Together they are about the size of Texas. While the open plains of Tsavo East give great opportunities for wildlife viewing – especially elephants, giraffes, buffaloes, zebras and occasionally lions – the rocky terrain of Tsavo West on the whole has especially beautiful landscapes. Somewhat further is Amboseli National Reserve, a much smaller but even more popular park. The majestic summit of Africa’s biggest mountain, the Kilimanjaro (located just across the border in Tanzania), can be seen from almost everywhere in the park. Many animals are present, but Amboseli is first and foremost elephant country. Close to Mombasa (35 kilometers) is also Shimba Hills National Reserve. It’s the last still existing rest of the tropical rainforest that covered a large part of East Africa in past days. 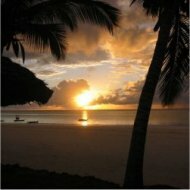 My favorite place for comparing and booking safaris and holidays in Kenya is Africa Guide. As dedicated Kenya specialists, they’ve put together a highly interesting set of over 150 safari and holiday packages against reasonable prices. Generally, the weather in Mombasa is fairly hot no matter when you choose to go. The coolest months are July and August, when the temperatures reach an average high of 27C (81F). The rainy season runs from April to June, and May has the most frequent rainfall. So keeping this bit of information in mind, you can pick the most suitable weather for your trip. Whatever you choose to do in Mombasa, holiday time always goes a little smoother with enough planning. There is an Information Bureau on Moi Avenue for guide books, maps and other tourist information. And while you are there, take a photo of the gigantic tusks reaching over Moi Avenue, which have become the city’s symbol.